I don't really enjoy camping. Not unless it is pretend camping in the basement with my 2 favorite boys! Tyson is now 19 months old and I planned most of these activities especially for him but Logan (age 3) joined right in and loved this play time too! We began by reading Kevin Henke's Bailey Goes Camping , a story about a little brother who is too little to go camping with his siblings. He is pretty bummed out until... he finds out he can "camp" at home. He builds a tent, goes fishing and swimming (in the bathtub! ), goes bear hunting with daddy, roasts marshmallows, and falls asleep under the stars. 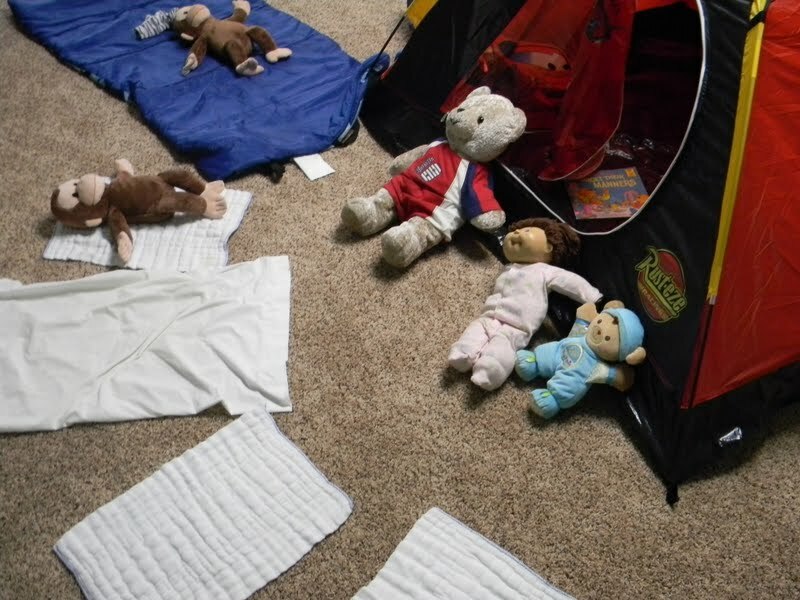 We set up our tent in the basement and then got a bunch of "babies" and "sleeping bags". We put one baby on each sleeping bag... a little early math, practicing 1 to 1 correspondance. We kissed our babies and practiced saying, "Night, night". We also set up a fishing corner. This was inspired by Logan's love of the magnetic fishing pond at The Magic House, our local children's museum. 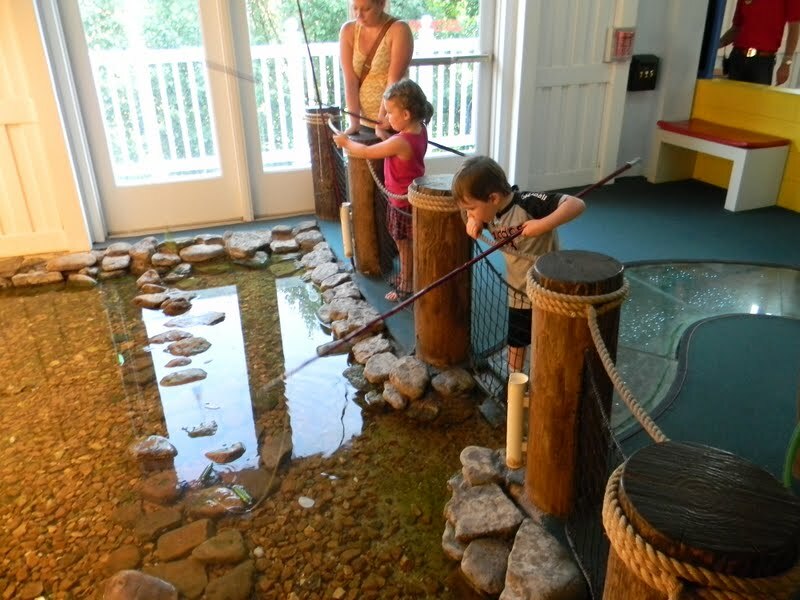 They have fishing lures that the kids can catch with magnetic bait. He would spend all day there. While I tried to talk Greg into building this in our yard, I had to settle for good old fashioned paper fish with a paper clip. Not only did we camp and fish, we even picnicked in the "great outdoors". We used our new dishes from yardsaling. I would give Tyson one piece of bread for his plate and one piece of bread for my plate. 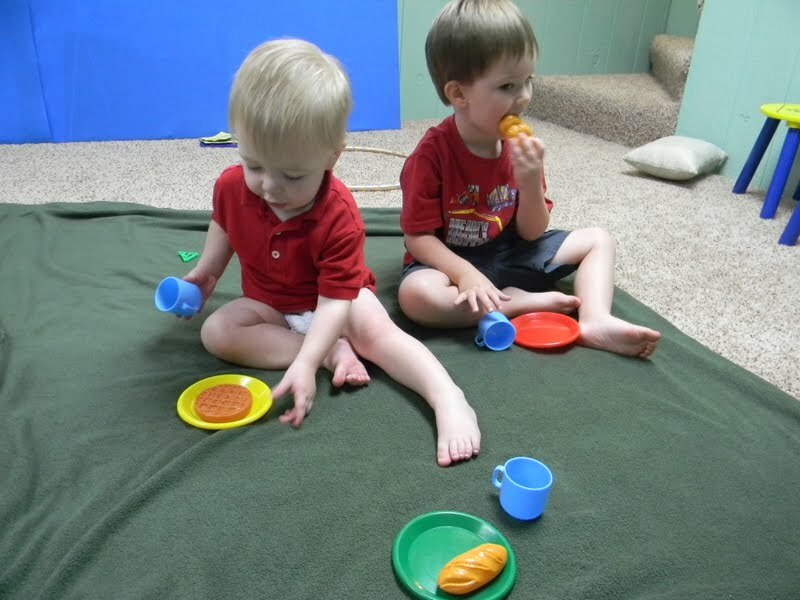 Again, learning 1 to 1 correspondance. I also named all of the objects as we "ate" and encouraged him to try and repeat the words. I also did a bit of "math talk" with Logan. "There are 3 people. Every person has 1 plate. There are 3 plates! If every person wanted 1 cup, how many cups would we need?" Of course, he still has to count it all out, but it will interesting to watch and see when he can begin problem-solving the answer without counting! 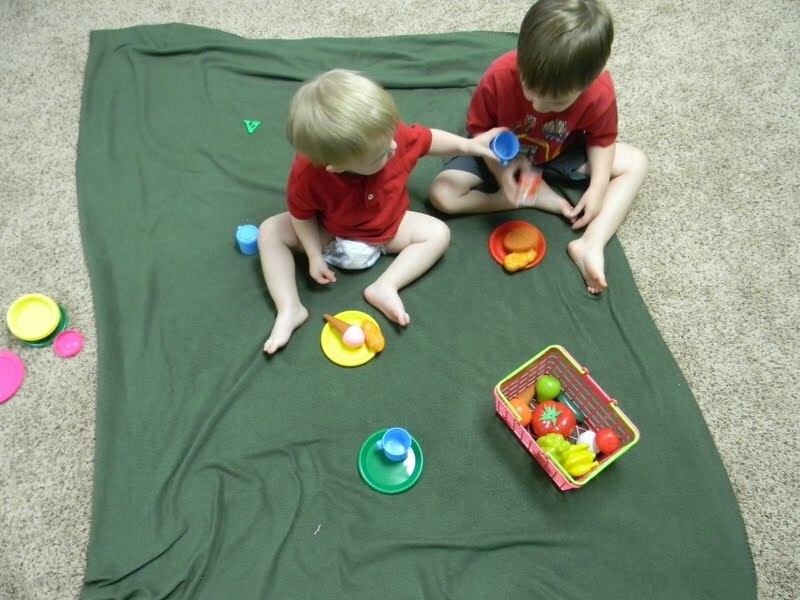 We had a lot of fun playing camping together and the boys are now playing with the camp set up in their independent play! This looks like a wonderful way to camp. I'm not really the roughing it type, but this is some camping I can go for. Love the idea! 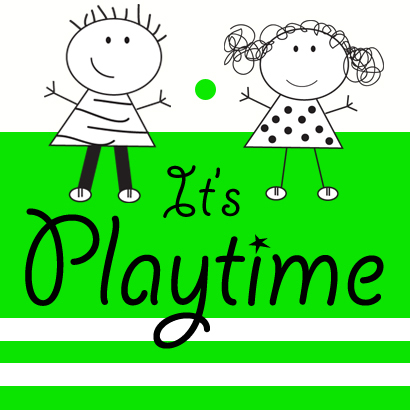 I am a new follower from the It's Playtime Link Party at Quirky Momma. 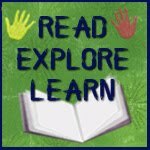 If you have a chance, stop by http://messforless.blogspot.com and say hi!